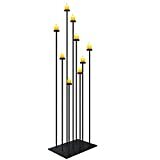 These cool new Etna Candle Holders are large floor standing candle holders inspired by lava-spewing volcanoes, minus the actual explosive eruption of lava, ash, and toxic fumes of course. These unique volcanic candle holders are crafted from solid pine wood with a conical shape and a colorful lava flow design at the peak where a protective glass cup sits in the vent to hold a flickering candle or tea light. They're available in a set of three sizes or individually in a variety of colors, including lava red. Tealights or candles up to 2.3"